AMP's offensive discipline created space to attack. Ultiworld’s reporting on the Mixed Division is presented by Universe Point cleats. All opinions are those of the authors. Please support the brands that make Ultiworld possible and shop at Universe Point! Philadelphia AMP won their first ever mixed championship on Sunday, and, at first glance, the strategy is deceptively simple. As one of the most fundamentally sound mixed teams in the country, the principles they followed are preached by coaches around the country: attack the open space, keep that space open for your teammates, and make your defender commit to covering something they don’t want to. Easier said than done, right? Doubly so against Seattle Mixtape, one of the most athletic and opportunistic defenses in the country. Well, AMP took all of that and put together a game plan that took advantage of Mixtape’s focus on winning individual matchups. Philadelphia made a concerted effort to keep lanes wide open by pushing inactive cutters as far out of the lane as possible and attacked downfield whenever there was even a slight opening. One of the trickiest things for teams to do is to open up space to attack, and maintain discipline in the cutting set to keep it open. Too often, even at the elite level, teams have a tendency to collapse on themselves and send multiple cutters to the same area on the field. Either cutters are not looking at one another and communicating who should attack, or the pressure of a big point causes players to panic and lose track of where they are supposed to be. Philadelphia does a great job of preaching stack discipline as a way to open up space on the field, and they do this regardless of how close a game is. Throughout the game against Seattle, you could see AMP clearing decisively and staying tight in the stack to make sure those lanes were open to attack. With Seattle’s defense focusing on tight person coverage, the more Philadelphia’s inactive cutters could keep the Mixtape defenders close to them and away from the active lane, the easier it was for Philadelphia to pick up easy yardage gains. This point, with AMP up 3-2, illustrates this offensive philosophy perfectly. Mixtape does a great job of initially shutting down the AMP offensive set, and getting defenders into the throwing lanes. However, you can see AMP push all the cutters to the far sideline when Sean Mott has the disc on the line. Mixtape did not want to poach too aggressively, knowing that AMP has the cutters and throwers to take advantage of an opening. Isolating into one-on-one matchups does AMP a huge favor, and Calvin Trisolini pushes his defender deep before coming underneath for a wide open 20-yard gain. Trisolini begins this sequence as an isolated downfield cutter, and he pushes deep at the exact time when Nico Lake bursts under for the reset, and the rest of the Philadelphia offense clears to the far sideline. Opening up that space gives Trisolini free rein over a huge part of the field, and with Mixtape sticking on their matchups instead of trying to poach that space, Trisolini catches an easy pass and changes the angle of attack. As a bonus, changing the angle creates some confusion in the reset space among the Seattle defenders, and Lake eventually finishes the point when Mixtape misses a switch. That is the ideal for vertical stack discipline, and it keeps the throwing lanes open for long strikes out of the handler set. You see Carolyn Normile make a quick horizontal cut to the open side as Lake picks up the centering pass from Trisolini. He makes one quick pump fake, and Normile is off to the races on a deep cut. As she does this, the Philadelphia stack stays tight together and moves a few steps towards the far sideline. All of the Mixtape defenders do their best to stick with the players in the stack, leaving Normile with a one-on-one matchup and plenty of separation to pull in a less-than-perfect huck. Yes, this was a pull play, where offenses tend to have the advantage, but it encompasses all of the elements that made AMP so successful in the final. They saw that Seattle was playing tight coverage without offering any help off the back of the stack, and made sure to keep the defenders occupied with their checks instead of switching or calling for poaches. Philadelphia also used long cuts to keep the defenders chasing instead of dictating where the offense could go, putting the defense in the unenviable position of committing to following their marks on every cut. After a Seattle turnover, Philadelphia sets up the same way its O-line sets up. Even though the disc is on the far side of the field to start, all of the cutters push to the far sideline to open up space underneath and on the open side. Nicky Spiva takes advantage of his defender tripping to get an easy under, and with the Mixtape O-line defense backing their marks, AMP has plenty of field space to work with. The cutters in the stack stay tight, and when Ryan Flamberg catches his defender looking to see where the disc is on the field, Flamberg sprints immediately to the end zone for an easy Philadelphia break. You’d be hard-pressed to find a cleaner offensive game from Philadelphia AMP. Last year’s thriller of a final had plenty of turns from both offenses, but this year, AMP’s offense was dialed-in. With only one turnover from the O-line, AMP showed how a tight, disciplined stack could defeat even the most athletic of defenses. Having throwers who can take advantage of those openings certainly helps, but without a structure to create openings and space to attack, throwers start to force passes into the heart of the defense. 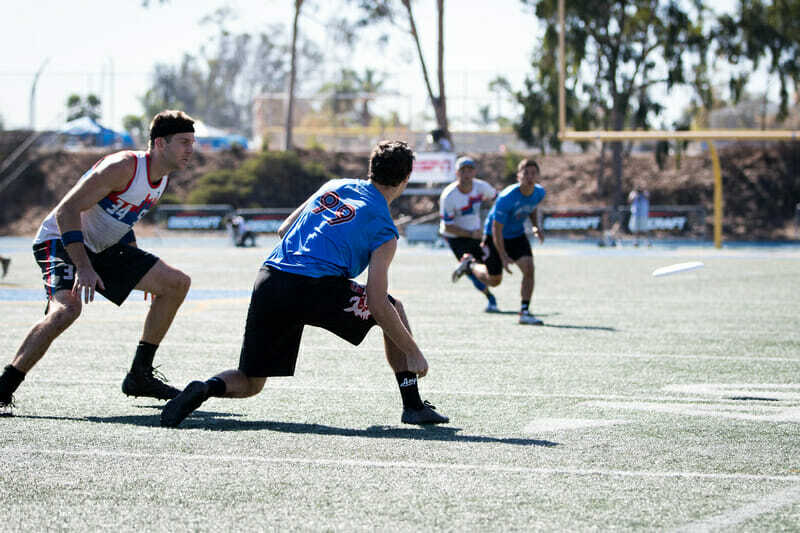 AMP’s offense took away that opening for Seattle, and ran away with their first title as a result. Comments on "Spacing and Structure: How AMP Ran Away With Their First Championship"